Like an enchanted fairytale castle, Costa Favolosa is surrounded by magic, decorated with precious materials and furnishings and perfected by state-of-the-art technology. Soaring, gothic-style spaces welcome guests to an atrium enriched with sparkling diamond-shaped decorations and regal entertainment at any time of the day or night. 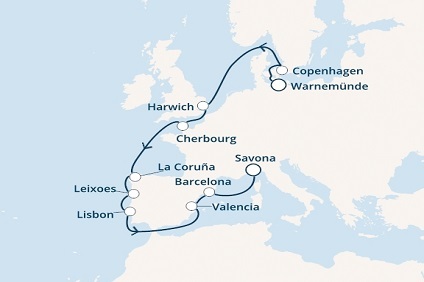 3 Night cruise sailing roundtrip from Barcelona onboard Costa Favolosa. 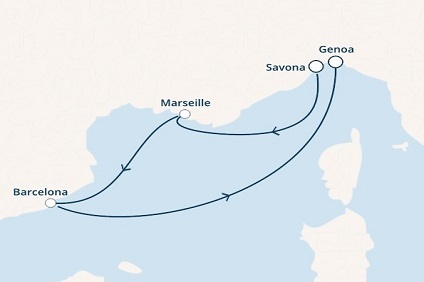 4 Night cruise sailing from Savona to Genoa onboard Costa Favolosa. 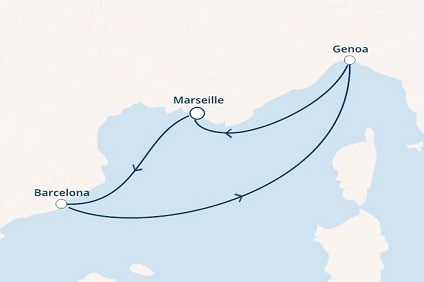 4 Night cruise sailing roundtrip from Marseilles onboard Costa Favolosa. 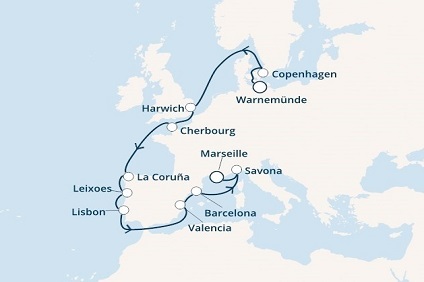 4 Night cruise sailing roundtrip from Barcelona onboard Costa Favolosa. 12 Night cruise sailing from Genoa to Berlin onboard Costa Favolosa. 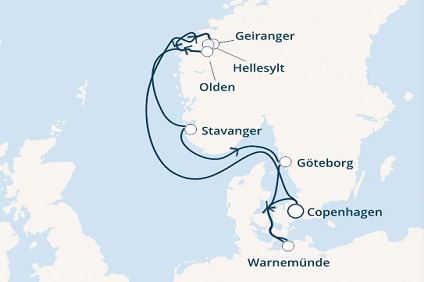 13 Night cruise sailing from Genoa to Copenhagen onboard Costa Favolosa. 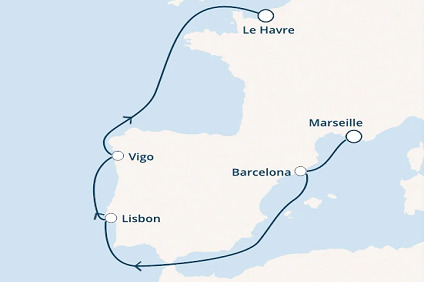 6 Night cruise sailing from Marseilles to Le Havre onboard Costa Favolosa. 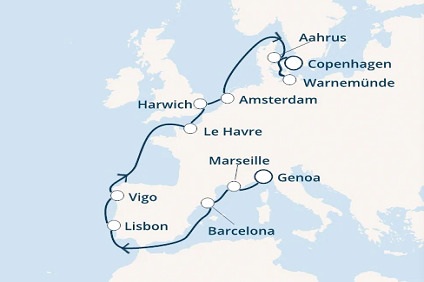 11 Night cruise sailing from Marseilles to Berlin onboard Costa Favolosa. 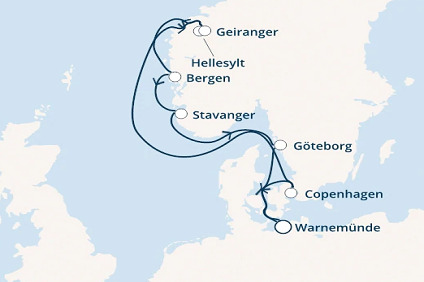 12 Night cruise sailing from Marseilles to Copenhagen onboard Costa Favolosa. 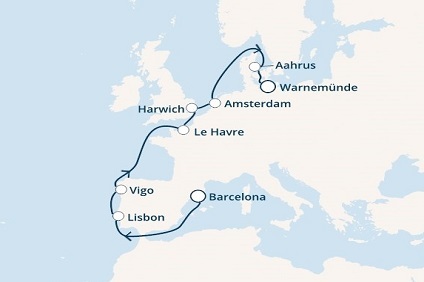 10 Night cruise sailing from Barcelona to Berlin onboard Costa Favolosa. 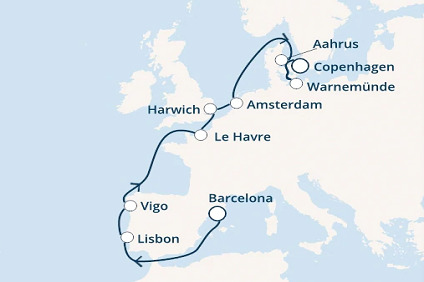 11 Night cruise sailing from Barcelona to Copenhagen onboard Costa Favolosa. 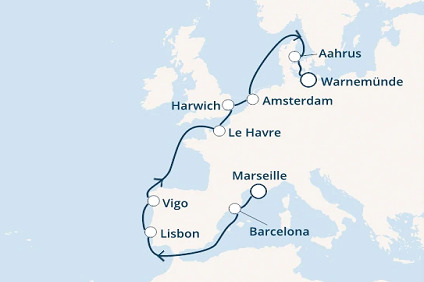 7 Night cruise departing roundtrip from Berlin onboard Favolosa. 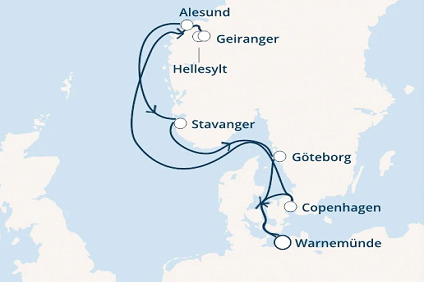 7 Night cruise departing roundtrip from Copenhagen onboard Favolosa. 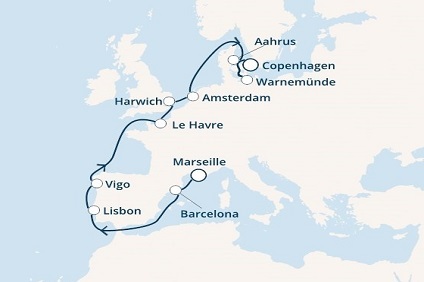 13 Night cruise sailing from Berlin to Marseilles onboard Costa Favolosa. 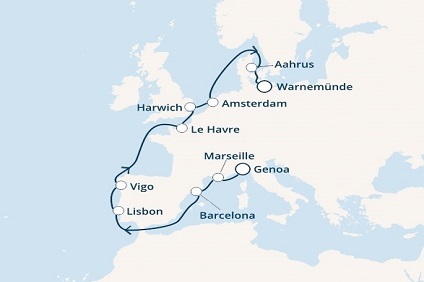 12 Night cruise sailing from Berlin to Savona onboard Costa Favolosa. These staterooms feature two lower beds that can convert to a queen bed, a single sofa bed, private veranda, private bath with shower, sitting area, direct-dial ship-to-shore telephone, TV, VCR, hairdryer, a safe, and convenient access to the Samsara spa at all times (220 sq. ft). Each spacious suite features two lower beds that can convert to a queen, a single sofa bed, private veranda, private whirlpool bath, sitting area, direct-dial ship-to-shore telephone, TV, VCR, hairdryer, and a safe. Guests staying in suites also receive VIP check-in, priority embarkation and disembarkation, butler service, daily fresh fruit, one bottle of sparkling wine, preferred seating at the ships many restaurants, and an invitation to the cocktail party with the captain. These staterooms feature a private veranda, two lower beds (most of which convert into a queen), a private bath with shower, direct-dial ship-to-shore telephone, TV, hairdryer, and a safe. (210 sq. ft., including veranda) Premium Cabins are privileged cabins in terms of size and position. Located on the upper decks of the ship they provide extra comforts, including free continental breakfast on request, served in your cabin, free service in your cabin (24-hour room service) and the option to book dinner for a specific time in the restaurant. These staterooms feature a private veranda, two lower beds (most of which convert into a queen), a private bath with shower, direct-dial ship-to-shore telephone, TV, hairdryer, and a safe. (210 sq. ft., including veranda) Classic Cabins are located on the first decks of the ship; they offer the most affordable prices for each cabin type, providing all the comforts of a standard cabin and the freedom to enjoy all the services and facilities available on the ship. These staterooms feature an ocean view, two lower beds, private bath with shower, direct-dial ship-to-shore telephone, TV, hairdryer, and a safe. (190 sq. ft.) Premium Cabins are privileged cabins in terms of size and position. Located on the upper decks of the ship they provide extra comforts, including free continental breakfast on request, served in your cabin, free service in your cabin (24-hour room service) and the option to book dinner for a specific time in the restaurant. These staterooms feature an ocean view, two lower beds, private bath with shower, direct-dial ship-to-shore telephone, TV, hairdryer, and a safe. (190 sq. ft.) Classic Cabins are located on the first decks of the ship; they offer the most affordable prices for each cabin type, providing all the comforts of a standard cabin and the freedom to enjoy all the services and facilities available on the ship. Sitting area, direct-dial ship-to-shore telephone, TV, VCR, hairdryer, a safe, and convenient access to the Samsara spa at all times. Each room features two lower beds (most of which convert into a queen), a private bath with shower, direct-dial ship-to-shore telephone, TV, hairdryer, and a safe. Premium Cabins are privileged cabins in terms of size and position. Located on the upper decks of the ship they provide extra comforts, including free continental breakfast on request, served in your cabin, free service in your cabin (24-hour room service) and the option to book dinner for a specific time in the restaurant. Each room features two lower beds (most of which convert into a queen), a private bath with shower, direct-dial ship-to-shore telephone, TV, hairdryer, and a safe. Classic Cabins are located on the first decks of the ship; they offer the most affordable prices for each cabin type, providing all the comforts of a standard cabin and the freedom to enjoy all the services and facilities available on the ship.